Ira Ryan builds a bike by hand, this being the head badge on the head tube.Some of every day should be non-digital, as in: Step away from the computer. This occurred to me after spending the afternoon making pictures of Ira Ryan making a bike by hand. My last words to him were: "Thank you for the non-digital time." Granted, I was making pictures with a digital camera. But the experience was anything but digital. And that is its value. Ira is the ninth person I've photographed who makes bicycles by hand in Portland. This is the personal project I've mentioned here, to make pictures of all 30 or so of the people in Portland who make all or some of their livelihoods this way. It's my gift to me and to them - each person gets at least one print. There is no particular destination for the pictures, other than the walls of the builders - at least I hope they feel compelled to display the photos. Maybe once the body of work is done, there will be another home for them. That's not the point now. The point is to get to know what I'm learning is an interesting, kind, talented, thoughtful group of people. And to slow life down and make pictures without over-thinking, just responding to each setting and the pace and personality and learning from them all. Ira was great to spend time with. He grew up in small-town Iowa, I was born in Iowa and grew up in small-town Nebraska. So we related on that level, for sure. 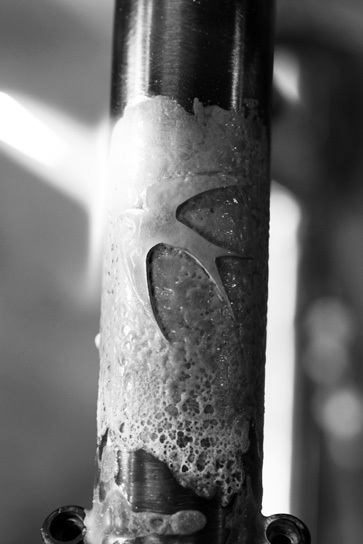 The head badge in the photo above is Ira's logo, a swallow that harkens back to the swallows that used to fly by the barn back home. Ira is rooted, kind and thoughtful. And can he make a nice bike! So mostly I just wanted to say thank you to Ira for the afternoon. Of course there is danger in photographing people who make amazing bicycles. I want one, of each.